Should I Buy Tesla Stock Ahead of the Model 3 Event? Subject: Should I Buy Tesla Stock Ahead of the Model 3 Event? six − = three Required Please enter the correct value. The Tesla stock price is up 21% in the last month, and the company is now preparing for its most highly anticipated event of 2016 this week. On Thursday, March 31, Tesla Motors Inc. (Nasdaq: TSLA) will unveil its most affordable electric car to date, the Model 3. The mystery around the new Tesla Model 3 has only added to the anticipation. CEO Elon Musk has dubbed the Model 3 the "everyman car" based on its price and expected appeal. The vehicle will carry a $35,000 price tag. In comparison, Tesla's Model S sedan and Model X SUV retail for $70,000 and $80,000, respectively. Buyers should be eligible for a $7,500 tax credit. That would make the overall price for many buyers closer to a Ford Fusion than a mid-priced luxury vehicle. That credit will only remain in place until Tesla sells a total of 200,000 electric vehicles. Based on Tesla's estimates, that could be about a year after Model 3 deliveries begin. The Model 3 is estimated to travel 200 miles on a single charge. Tesla will begin taking reservations for the Model 3 on March 31, right after the live unveiling at 8:30 p.m. PT. The Model 3's debut can be viewed on the company's website. For $1,000 down, customers can reserve a Model 3. Existing Tesla car owners have priority. Model 3 production is scheduled to begin in late 2017. When production begins, Tesla will start with deliveries in North America on the West Coast, and then will move east. 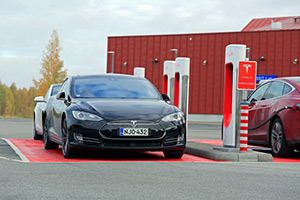 As production ramps up, Tesla will begin deliveries in Europe and right-hand drive markets. Money Morning Technical Trading Specialist D.R. Barton has been bullish on the Tesla stock price all year, saying it's "head and shoulders ahead in the electric car front." And with worldwide revenue from electric vehicles forecast to bring in $488.54 billion by 2030, Tesla stock needs an affordable vehicle like the Model 3 to appeal to the masses. Tesla shares are up a meteoric 454.51% over the last three years and 890.54% over the last five. The Model 3 could send the Tesla stock price even higher. The company has improved production and delivery times, which will boost profits. And Tesla has done so without compromises. Tesla is revered for building great cars. Still, with the kind of volatility Tesla and global markets have experienced this year, TSLA stock is not for short-term investors. Tesla stock is a momentum play, so any negative news story has the potential to send shares lower in the short term. But for long-term investors looking to buy and hold a stock for five to 10 years, TSLA stock is one of our favorite picks. Musk's unparalleled vision and ability to create revolutionary products have propelled Tesla to the forefront of the electric vehicle market. In the current year, Tesla is expected to post earnings per share (EPS) of $1.31, which is up from a loss of $2.30 per share last year. By 2017, full-year EPS is expected to hit $3.34. Revenue is projected to climb 50% in the current quarter and 62% for full-year 2016. "I think Musk is the most innovative CEO on the planet and that he sees value others don't yet recognize," Money Morning Chief Investment Strategist Keith Fitz-Gerald said in 2015. "Cars, batteries, innovative business models – nobody knows where it will go but ultimately if you're along for the ride, I think it'd be very hard to go wrong over time." Stay informed on what's going on in the markets by following us on Twitter @moneymorning or liking us on Facebook.